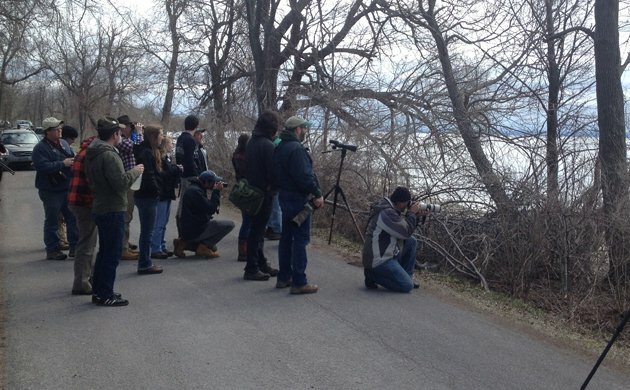 On Thursday, 24 April, Eugene Nichols was minding his own business, birding along the shore of Lake Ontario on Point Peninsula, in the far northern reaches of New York State. He found an all white bird that didn’t belong and eventually deduced that he was looking at a Willow Ptarmigan. He contacted Jeff Bolsinger, a top birder from northern New York, and they went to the site and refound the bird the next day. 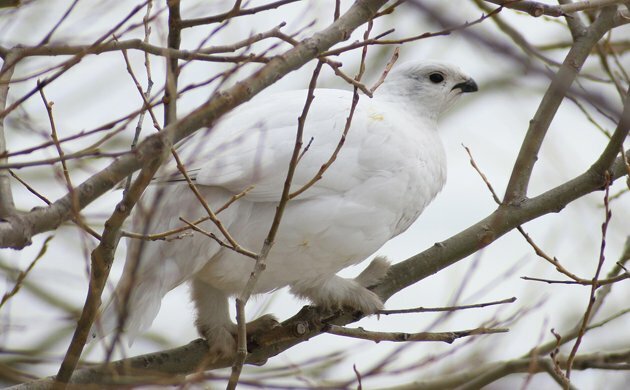 Word got out, the New York State birding community lost its mind, and the weekend saw carloads of birders from all over New York and surrounding states and provinces making the long drive to Point Peninsula to see an all-white bird the size of a football. 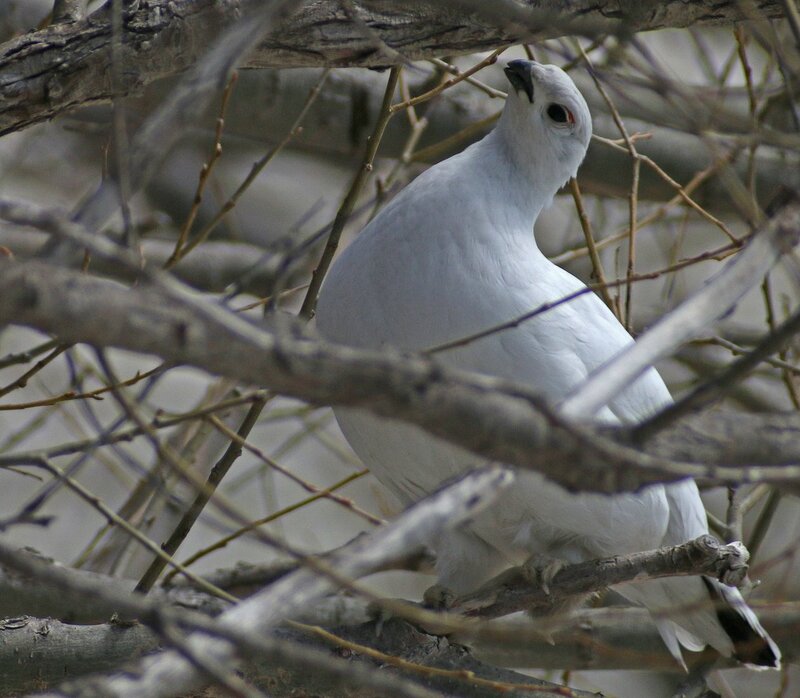 Why was everyone so excited to see a Willow Ptarmigan? 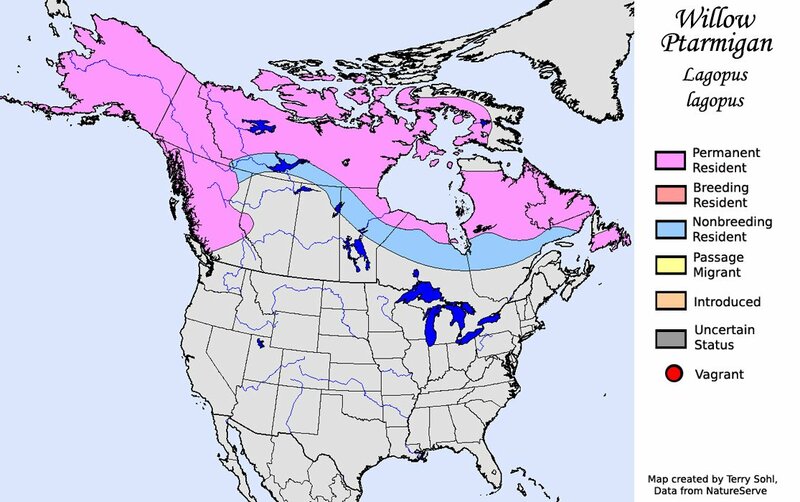 Well, below is the range map for Willow Ptarmigan, borrowed from South Dakota Birds and Birding. Note how far New York State is from even the bird’s winter range. This football-sized bird was way out its normal range. Also, note the lack of red dots to indicate where the bird has shown up as a vagrant. 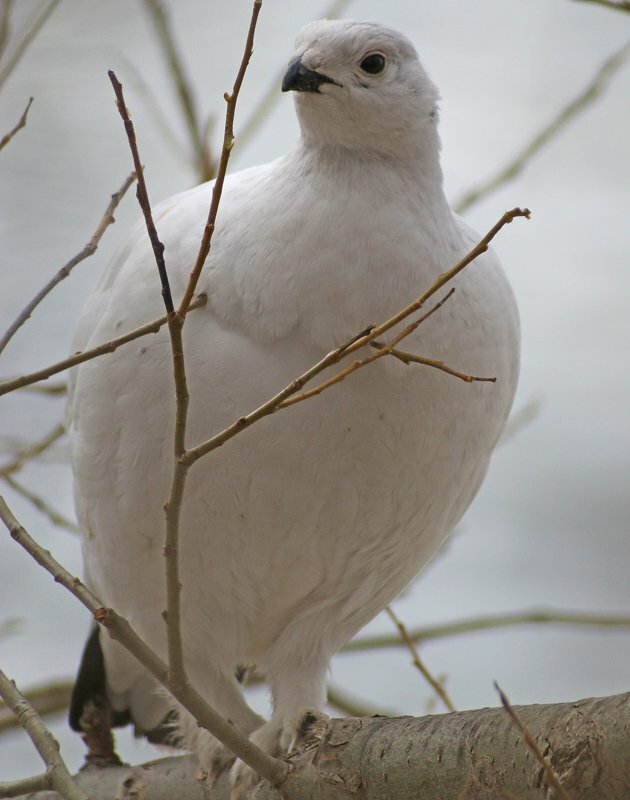 This was only the second Willow Ptarmigan in the lower 48 states in one hundred years! Of course, I had to go and see the bird! But when? Saturday was out, as family plans had been made, but I had already been cleared by Daisy to bird most of the day on Sunday. I had to get out of dinner plans, but that wasn’t terribly difficult, though the price paid was high. (Never fall in love with and live with a woman who is also a lawyer.) Next I had to find some co-conspirators to ride with all the way up to Point Peninsula, a twelve-hour round-trip from New York City. Fortunately, I found two willing accomplices, Donna Schulman, who you will recognize as the book-reviewer extraordinaire here on 10,000 Birds, and Steve Walter, who in addition to being a great bird photographer also has a penchant for finding rare birds. I picked Donna up at 4 AM on Sunday, Steve at 4:20 AM, and we were heading across the Whitestone Bridge out of Queens by 4:30 AM. The fastest route was across New Jersey and a big chunk of Pennsylvania on Interstate 80 and then north forever on Interstate 81. We crossed the Delaware Water Gap, the Endless Mountains, the Southern Tier of New York, and then, as I pushed my Ford Focus to its limits, we crossed the law and the law won. He seemed disappointed by our lack of interest. Of course, this is the ideal way you want things to look when you are arriving on a long twitch, as it means that the bird is present. And, sure enough, it was! The bird spent all of its time while we were present in the willow trees on the shore, alternating between resting and eating willow buds. This made us jealous of those who had went up to see the bird on Saturday and gotten unobstructed, point-blank shots of the bird on the beach. Despite the branches that were constantly in the way, we still managed to get pretty good looks at the bird, and we enjoyed our two-plus hours watching and photographing it. We also enjoyed Caspian Terns, Cliff Swallows, and a variety of ducks on the lake. Despite the distractions other birds provided, our optics kept turning back to the ptarmigan, a truly magnificent beast! Our ride back to Queens was uneventful, though long. We got back exhausted and elated and thinking that the trip was well worth it. 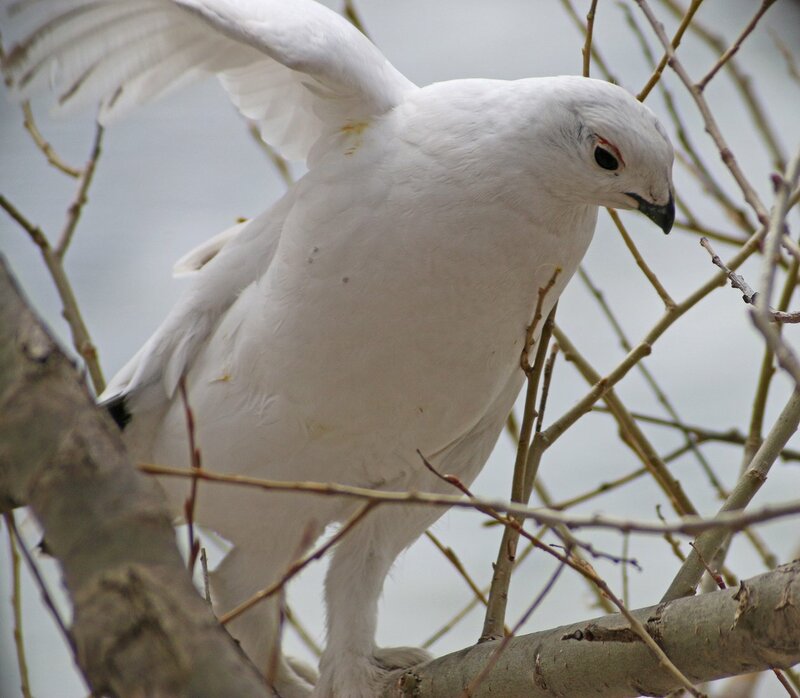 WILLOW PTARMIGAN! Good luck if you go in search of this bird. Please remember to give it space and that the land off the road is private. With the ridiculous run of good birds in New York State over the last several years this begs the question. What’s next? Holy! Congrats on getting the bird. If I still lived in Niagara Falls, I would have also driven several hours and seen you there! So glad to run into you Saturday and we are very happy to see that your excursion was fruitful. Sorry to hear about the ticket, but it does add even more dramatic effect to the story. Look at the feet of this bird! Are they not the most furry humongous feet you’ve ever seen on a bird? 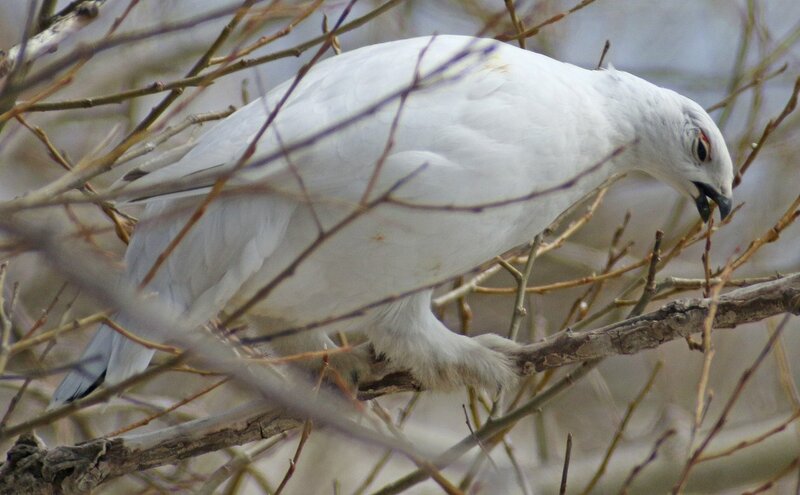 It was truly impressive watching the Willow Ptarmigan climbing and clasping thin branches with those feet. And, it was similarly impressive watching Corey with that state trooper; he really knows how to sweet talk a lawman. (To no avail, but it was a good try.) It was a good twitch. Seen one! Actually not a hard bird to get in the UK, although they don’t turn white there, and some patriotic Brits try and split them off into their own species. Any bird named after whiskey is clearly superior!